1. A good size tank. The bigger the better, I find a 20L tank is perfect for a single Betta. 4. 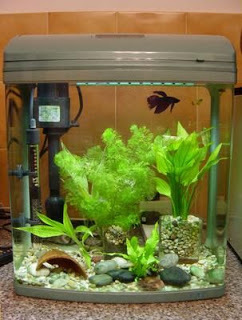 Plants (live is best – but if you want fake, silk is the way to go, plastic plants can tear your Bettas finnage). 7. A small heater. Size depends on tank size, usually a 25w or 50w is perfect. 9. Air pump for filter, with airline tubing to connect them. To set up a Natural Planted Tank, click HERE. Firstly, wash anything you’re putting in the tank (including the tank) thoroughly. 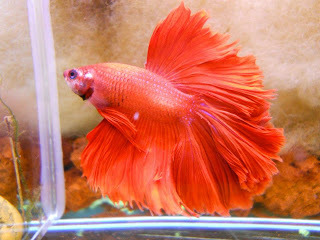 Do not use soap or any sort of cleaning products as this can kill your Betta. I rinse in hot water (I wear washing gloves so my hands don’t burn), and then hose out, and leave to dry in the sun for a few hours. After cleaning, put gravel in the tank. Add a plate on top of the gravel, and carefully pour the water to the halfway point, pouring the water onto the plate. This ensures the water doesn’t stir everything up. At the halfway point put in plants anyway you like – live is best, my bettas LOVE Java Moss, it’s super easy, and helps with water quality. Although, if you don’t like live, silk plants are the next best option. With silk plants, the Betta’s long fins won’t get caught and torn, which leaves them open to disease. If you want decorations, just make sure they aren’t sharp or have anything the Betta’s fins can get caught on. Tip: brushing a piece of lady’s stocking against an ornament/fake plant is a good way to determine if it will tear your Betta’s finnage. If it snags – even in the least – it will damage your Betta. Bettas are tropical fish, so the ideal temperature should be 25-28ºc. A heater will keep the water temperature stable at this temperature. Without a heater, there are too many drastic temperature fluctuations, and this leaves fish open to disease. As discussed earlier, Bettas are tropical fish and need warmer water to thrive. Filters will, well, filter your Betta’s water. Water changes are still required, however, but it does lessen them, and keep the water quality better between them. I highly recommend sponge filters. Although small, sponge filters filter water sufficiently, using both mechanical and biological filtration. They also do not provide a strong current in the water, and Bettas get stressed out by currents. Air pumps are required to work sponge filters. TIP: Air pumps can be quite noisy, and I’ve found that if you put the pump above the water level, it is quieter. Placing something soft under the pump helps, too. Water conditioners take out any harmful things such as chlorine that is in tap water. Aging water also helps to evaporate chlorine too, as some conditioners take a while to work. NOTE: just because you age the water, doesn’t mean you don’t need water conditioner. Always use the directed amount of conditioner, and you only need to treat the water you’re putting in. Depending on the size of your tank and if you have a filter or not, will determine on how often you will need to clean your tank water. Usually small weekly changes are required. Use a small siphon, remove any dirt/waste/uneaten food. Make sure to get in that gravel, and don’t forget behind any ornaments! On a basic water change, on a tank, removing roughly 20-30% of the total water volume is ideal. Before you get your Betta, make sure it has a home to come to. Cycling your aquarium before hand is very important. Basically an aquarium is a miniature ecosystem, so a balance must be made before adding livestock. A tank should have a sufficient amount of beneficial bacteria in it. The beneficial bacteria essentially get rid of waste, which fish produce. Fish waste is Ammonia (NH3). Without beneficial bacteria, ammonia builds up, and that is toxic to fish. Aquariums take time to develop beneficial bacteria, and the process of the tank establishing, is called cycling. There are types of beneficial bacteria which use Ammonia as part of their metabolism. This converts the Ammonia to Nitrite (NO2). Unfortunately, Nitrite is also toxic to fish, but slightly less so than Ammonia. However, another type of beneficial bacteria used Nitrite for their metabolism. The Nitrite is then converted to Nitrate (NO3). Nitrates are far less toxic to fish than Ammonia or Nitrite, but still shouldn’t be allowed to build up. To stop the build up of Nitrates, waterchanges must be done. From here, the cycle is complete. This can take anywhere from 3 to 6 weeks, depending if beneficial bacteria was seed from another established tank (by placing in filter media, aquarium ornaments, or substrate. Water from an established tank doesn’t hold much Beneficial Bacteria). During the cycling process, don’t add all the fish at once. If the tank goes from empty, or barely stocked, to fully stocked quickly, the bacteria colony will not be able to cope with the sudden increase of waste (ammonia). It is best to add fish slowly, getting only one two at a time, and slowly increasing the number over a few weeks. To ensure the tank stays cycled and healthy, weekly partial waterchanges are to be done. It is important to never do a full water change, or scrub out tank ornaments, substrate (gravel), or filter media. If this is done, the beneficial bacteria will be washed out, and the cycling process must restart. If your fish is sick, it is best to medicate in a separate tank or bucket, rather than straight into the aquarium (unless the package says it is safe for beneficial bacteria). Most medications will kill off beneficial bacteria, as well as the disease. Don’t add chlorinated water to the aquarium. Chlorine is harmful both to fish and beneficial bacteria. Use water conditioner to remove all chlorine and other harmful chemicals from the water. When feeding your Betta, there are many choices. Betta’s are carnivores (meat eaters) and in the wild will eat any small insects that happen to land on the water. Freeze dried food are inexpensive and have a long shelf life. Although, they can easily create constipation and swim bladder problems. Some brands can have bacteria in the feed, and cause sick Bettas. 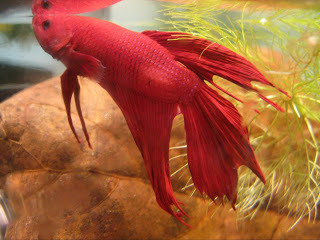 For these reason’s many Betta owners stay away from freeze dried food. Live food is the best for your Betta. Cultures are available for you to grow your own food, but can be a bit of a hassle if you only have one or two Bettas. Brine Shrimp, blackworms, mosquito larvae, and bloodworms are great all choices! Frozen food is often found in Fish and Pet stores. They are a great option for Bettas, I use frozen bloodworms and brine shrimp as a treat – my bettas love them! Flakes and pellets are a very popular choice. There are many varieties, and can be found in any fish or pet store. Try to look for dry food for Bettas, as it is made to suit their dietary needs. Peas? Well, actually peas can be fed to Betta’s to prevent/cure constipation. I use frozen peas that are already cooked, and take one or two peas per Betta, pop it in a cup of hot water to thaw. After that, peel the shell off the pea (pricking it with a toothpick, and squeezing the pea works well), then cut it up into small pieces. Lastly, cut the sharp point of a toothpick and put the pea on it. To feed to your Betta, place it on the water surface and wriggle it around a bit to get your Betta thinking it is live food. Your Betta may not take it at first, but be persistent. Once he eats it and finds it as food, next time your Betta will gobble it up. Peas can be feed to your Betta to prevent constipation. A weekly 24-48hr fast is recommended, followed by peas the next day. This helps clear out your Bettas digestive system. With all these choices, I find variety is best. Just remember don’t overfeed; forget the food directions that say to feed your Betta whatever they can eat in a few minutes. Healthy Betta’s will happily eat themselves sick. A little food goes a long way – after all, the Betta’s stomach is about the size of one of its eyeballs. In the wild, Betta’s would rarely kill each other in a fight. Once defeated, the loser will just simply swim away, as there were thousands of acres of water. It wasn’t uncommon for a male wild Betta could have up to a square meter of territory. This can’t quite happen in the aquarium, but they settle for however big their tank is. If two males share, there isn’t enough room for both so they will fight until one leaves, but since that can’t happen, they kill each other. Separate tanks are therefore needed for each male. Even a pair will fight, and cannot be housed together. If not breeding, there should always be only one Betta per tank. Females on the other hand, can be kept together. If together there should be at least more than five, this ensures there won’t be a strong pecking order where one would be consistently picked on. When having females together, make sure there is plenty of space with lots of hiding places for stressed females to retreat. Sometimes, there would be one female who is a bully, and she should be removed to ensure the safety of the other Bettas. Although, like I said with only having more than three females together, I have two females who just love to be together by themselves, and even seem depressed when apart – it all depends on the personality of the individual fish. Bear in mind, female Bettas can also get quite feisty, and sometimes sororities just don’t work. It really depends on your Betta’s personality. For people with multiple Bettas, there are many choices on housing. Betta barracks are a good idea, say if you have a large tank with a Betta who won’t get on. Just be sure to get the largest possible. The bad thing about these, are they are usually too small to permanently house adult Bettas. Divided tanks are also a good idea, but there are ones available that have holes in the dividers so you only need one filter/heater, and they are a good option. The only downside is, if one gets sick, there is a good chance the other fish will as well, as they share the same water. It’s a good idea to card fish in barracks or divided tanks. Constantly being able to see another Betta is stressful, and eventually they will not flare up anymore. Cutting the plastic from the cover of a display folder is a cheap option, and it works well. Barbs Barbs or any other fin nipping fish should be avoided. As they will be drawn to the Bettas long finnage, and nip it. Barbs and other fin nipping fish are a lot faster than Bettas, so the Betta will not be able to get away. This could either leave the Betta open to disease or even kill him. Fancy Guppies Although Guppies make good tank-mates with Betta’s temperament wise, if you want to mix them, make sure not to get the really colourful and fancy-tailed ones. Fancy, colourful guppies may be confused for another male betta, resulting in a fight. This could be the death of your guppies. Angel Fish or other fish with long tails. Angel fish have beautiful, long tails that may also confuse your Betta to thinking they are another Betta. Angel fish can also be territorial and show aggression. Large, territorial fish Avoid large, territorial fish. Cichlids are a good example, and they also have different water requirements. Oscars, a type of cichlid, are a popular choice in a home aquarium, but they will fight and eat anything smaller than themselves. Any other tropical fish that do not have long flowing fins, or are fin nippers, should fine with Bettas. If you need to go away for a weekend trip, don’t worry about your Betta too much. Betta’s don’t need to eat every day, although this doesn’t mean you’re able to slack off if you feel like it. Just before you leave, give them a normal feeding (giving them a big feeding will make them pass a lot of waste while you are gone), check their health, and make sure the filter and heaters are working. Remember to cover the tank before you go, too. If you are going away for a week or longer, it is best to find a fish sitter. 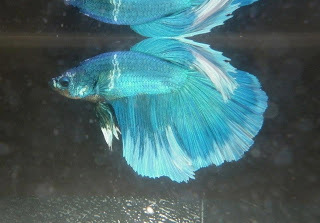 Make sure this person is reliable, and will care for your Betta well. Show them how to feed your Betta, how to clean the tank (if necessary). It often helps to write a clear and simple ‘to-do-list’. Try to keep the maintenance to a minimum. I found this site very helpful. I didn't know that bettas could eat peas. I will have to try it tommorow as he has already eaten today. I was quite surprised when I first found out also! Peas are a great way to let your Bettas digestive system rest & flush out – also really help if they get bloated! What should I do if the tank has been contaminated or has disease? Thanks. This site rocks!!!!!!! I scrub with salty salty water, rinse really well, repeat. My betta, Orius, has a ripped up caudal fin. It looks all raggedy but just on the end. I started treating him with bettafix yesterday. Is this stuff good or should I be doing something else as well. Thanks. Do you know if there is any difference between a betta water conditioner and a regular water conditioner? Or are they basically the same? I use prime for my tanks. So if you go away for the weekend do you leave the lights on or off in your tank?